MIAMI (August 16, 2016) — Carnival Corporation & plc (NYSE/LSE: CCL; NYSE: CUK), the world’s largest leisure travel company, today signed an addendum to one of its most strategic passenger terminal agreements, extending the contract through 2030 with an additional five years of sailings to and from Fort Lauderdale-based Port Everglades, one of the world’s top three cruise ports. The addendum builds on the landmark 15-year agreement reached in 2010 with the Broward County Board of County Commissioners and furthers Carnival Corporation’s commitment to Port Everglades, which overall has more than 3.6 million multi-day cruise passengers a year. Overall, the agreement and business generated from Carnival Corporation’s brands operating at Port Everglades produces a significant positive economic impact for the port and county. As part of the addendum, Carnival Corporation will have preferential use of Cruise Terminal 4, which reopened last year after $24 million worth of renovations and upgrades designed for greater efficiency and guest convenience. Additionally, the port is currently undertaking an estimated $13.6 million slip extension project on Terminal 4, expected to be complete by the middle of 2017, that will lengthen the slip to accommodate larger cruise ships. As part of the long-term agreement, the company also has preferential use of three additional terminals, Cruise Terminals 2, 21 and 26, along with one additional terminal. This provides five terminals in total for Carnival Corporation to serve its guests who visit Fort Lauderdale as part of their cruise vacation. Furthering its dedication to the port, the company will add a second ship from its Carnival Cruise Line brand, Carnival Splendor, to sail from Port Everglades during the 2017 summer season. In addition to Carnival Cruise Line, six more of Carnival Corporation’s 10 global cruise line brands currently carry nearly a million and a half passengers to and from Port Everglades each year. These brands include Holland America Line, Costa Cruises, Cunard Line, P&O Cruises UK, Princess Cruises and Seabourn. The seven Carnival Corporation brands and 28 different ships account for a combined average of more than 300 calls at the port each year. As part of the original agreement, the port undertook a $54 million cruise terminal renovation project to make significant improvements to four existing cruise terminals to accommodate ships from Carnival Corporation’s fleet of global cruise line brands. Enhancements made as part of the project included features to enable simultaneous embarkation and debarkation processes, including two passenger loading bridges, separate and larger baggage halls and improved ground transportation areas. 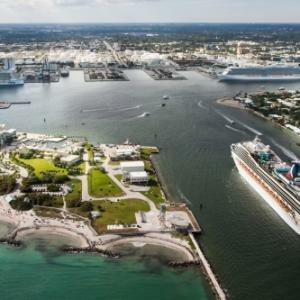 As part of the extension, Carnival Corporation and Port Everglades will engage in discussions to examine the opportunity for possible further improvements to Cruise Terminal 21 to accommodate Carnival Corporation’s newest class of ships. As one of South Florida&apos;s leading economic powerhouses, Broward County&apos;s Port Everglades is the gateway for international trade and cruise vacations. Consistently ranked among the top three busiest cruise ports in the world, Port Everglades is also one of the nation&apos;s leading container ports and South Florida&apos;s main seaport for receiving petroleum products including gasoline, jet fuel and alternative fuels. The Port Everglades Department is a self-supporting Enterprise Fund of Broward County, Florida government with operating revenues of approximately $153 million in Fiscal Year 2015 (October 1, 2014 through September 30, 2015). It does not rely on local tax dollars for operations. The total value of economic activity related to Port Everglades is nearly $30 billion. More than 226,500 Florida jobs are impacted by the Port, including 12,840 people who work for companies that provide direct services to Port Everglades. For more information on Port Everglades, visit porteverglades.net or email PortEverglades@broward.org.